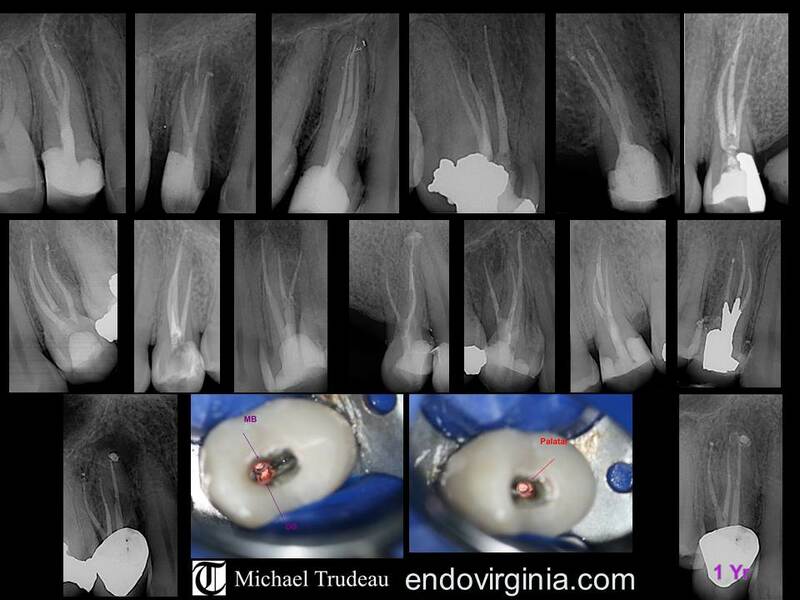 This is a blog created by 5 endodontic colleagues to share their work. We did everything possible to balance the need for remaining tooth structure and still accomplish our goals for endodontic therapy. Everything looks good and feels good a few years down the road. This nice patient presented with pain on her lower right molar. We determined that endodontic therapy was necessary. This particular tooth exhibited a C shaped canal system in a fused root. Visible on the peri-apical radiograph was the presence of three canals as well as the proximity of the root tip to the inverior alveolar jaw nerve. After starting treatment and getting the patient out of pain, two of the canals were found however, the third was not. The CBCT gave me a 3D image that showed me where to look for the third canal. It also showed me that the jaw nerve passed right under the root tip. Care was taken not to introduced any medicine or sealer into this vital structure. We treated this patient a little over a year ago. The tooth has a complicated canal system characterized as "C" shaped. This is fairly common in fused roots. The tooth has been functioning comfortably since treatment and a nice crown was fabricated. This tooth is a dens in dente or tooth within a tooth. This presents technical challenges for cleaning and obturating the tooth. A CBCT gave detailed information about the anatomy of the tooth and helped in planning the access. Using the microscope both the internal and external parts of the tooth were treated. In addition, the large lesion was treated with a decompression or drain procedure. The access was restored with 2 fiber posts and composite. This tooth is a radix, which means it has a fourth root, often a little shorter. It many times will have a little hook on the end of this root. Additionally, this tooth had three mesial canals. We chose to treat the tooth through two small accesses to retain the core buildup. Premolars can have 3 roots as shown here. Detecting the morphology type of this tooth is important to have a favorable endodontic outcome. A CBCT can help determine the root form of these teeth and aid in their treatment. The microscope helps locate the canals without removing valuable tooth structure . Special care must be given to not over-instrument these teeth so that they don't have structural failures down the road. Fused roots on lower molars often have complicated anatomy. The shape of these canals often have a C shaped cross section. Putting them side by side, allows for appreciation of the diversity of this tooth type. The patient presented with a large intra-oral swelling. Also, the central incisor had supra-erupted. There was some concern that a surgery might cause problems with the adjacent tooth, so we managed her case with a drain procedure called a decompression. Longer term calcium hydroxide medication ensured radiographic healing, and some short term braces fixed the alignment problem. Resorption is a process where the tissue begins resorbing the natural tooth. It can destroy the whole tooth if left untreated. In this case, a 3D xray of the tooth showed the extent of the resorption leading to the nerve space. The root canal was performed, a fiber post was placed. Then the resorption was dealt with a surgical filling. The result was very esthetic. The patient has been asymptomatic for an entire year and happy with the looks. Everything looks good on the checkup x-ray. This tooth was symptomatic and caused significant swelling to the patient's face. Using the dental operating microscope, the screw post was removed with ultrasonic instruments. We found 3 canals in the distal root, 2 canals in the mesial root. After 4 weeks in a calcium hydroxide dressing, the tooth was asymptomatic, and the swelling was gone. The root filling and core were placed. At two years, there is significant healing evident on the radiograph and the tooth has remained pain free. 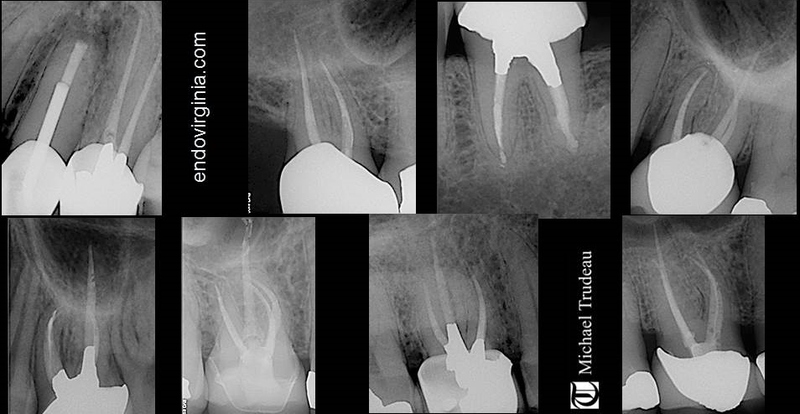 Sometimes, during the course of endodontic treatment a file is separated. In this case a dentist separated a rotary file. I thought, that since there was a fairly significant radiolucency consistent with root canal infection, it would be best if the instrument were removed. Using the microscope, ultrasonic instruments, and some handfiles, the instrument was removed without a great deal of tooth removal. A bonded core filling was then placed and the occlusion flattened. At the one year mark, the radiolucency has completely resolved, the tooth is asymptomatic and functional. I saw this patient for another tooth today so we took a checkup x-ray of the work we did 2.5 years ago. At the time the patient presented with both pain and swelling in the lower chin area. The radiograph shows an apical finding as well as a lateral finding. Using the dental operating microscope we removed the large screw post through the existing crown. We then located an additional canal within the tooth. After a few months of calcium hydroxide medication, we placed the root-filling and cemented a fiber post to not only help retain the core and crown, but hopefully help decrease the likelihood of the tooth snapping off at the gum line. In this case, the patient experienced pain to biting on a previously root-canal treated tooth. The 3D x-ray called a CBCT or conebeam suggested an untreated part of the tooth. Using the dental operating microscope in conjunction with this 3D x-ray, we were able to successfully manage the tooth. The final x-ray was taken at a 1 year checkup. It shows healing, and the patient reports that the tooth is completely functional and free from biting pain. Yesterday, I saw a number of patients for re-evaluation just to make sure that their teeth were feeling well and that there were no signs of infection on the radiograph. Everyone looked and felt great! Dental trauma affects 1/3 patients. In this case a crown fracture led to the premature death of the pulp within the lateral incisor leading to an infected tooth. At the time, the tooth had not completed development and the apex had not formed. The pulp was removed and Calcium Hyrdoxide was used as a dressing to facilitate bone healing over the course of 4 months. After significant healing had occured, an MTA cement was used to seal the apex. A fiber post was placed to help prevent a horizontal root fracture in the future. Premolars are often thought of as easy teeth to treat. This premolar has three roots. The microscope allows for conservative treatment of the tooth and restoration with fiberposts and dual cure composite. Endodontic Internal resorption is very rare- it is a condition in which the pulp tissue turns against the dentin of the tooth removing valuable tooth structure. In this case there was a perforation at the gumline from the inside out. The tooth was reinforced with three fiber posts and the communication restored with composite. The esthetic result was excellent. This patient presented with external resorption on the facial aspect of her canine. A CBCT was taken to determine the location and extent of the resorption. The tooth was treated with root canal therapy and restored with a fiber post. The lesion was then removed surgically, the affected dentin treated with trichloroacetic acid, and finally restored with a composite. During the course of initial treatment by another doctor, an instrument was separated on a curved root of this upper molar. The instrument was removed, and all 4 canals were cleaned out and root fillings were placed. Additionaly, an amalgam core was placed to prevent any leakage. Lower molars are thought to have 3 canals. However, a mid-mesial canal is not a rare finding. It does take significant magnification with co-axial light in order to address this canal. This patient presented with a swelling on the side of the tooth and a deep pocket associated with infection. The infection was caused by a mid-mesial canal. After finding the 3rd mesial canal with the help of a dental operating microscope, the canal was cleaned and medicated. The swelling resolved and the deep pocket returned to normal. Normal bone returned in the furcation area as evident by the followup radiograph. Lower anterior teeth often present with difficult anatomy. This tooth is an example of such anatomy. The tooth root is thin which doesn't allow much room for error in searching for root canals. This tooth had 3 canals which were found and treated. 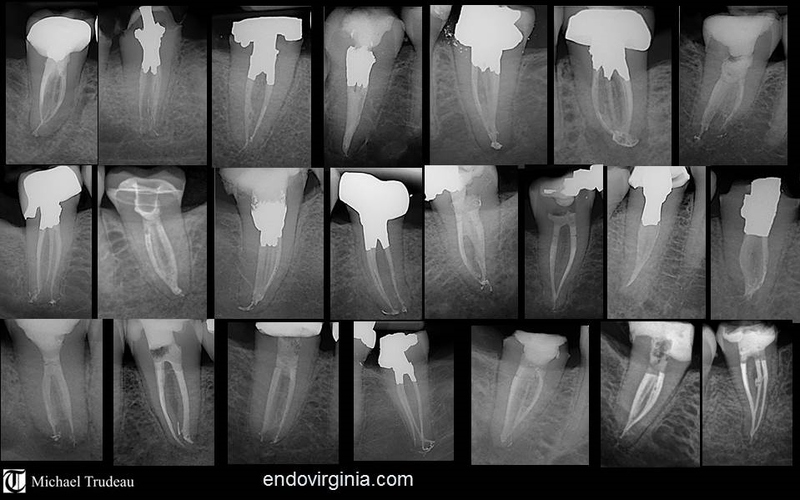 Patients treated with esthetic full mouth rehabilitations will often require endodontics. It is important to the patient to provide access preparations which are conservative and which allow for fiber post reinforcement subsequent to endodontic therapy. A porcelaine bonded composite masked the endodontic access. This patient presented with pain and swelling associated with a persistent root canal infection. He had been treated with a full mouth rehabilitation with many cast post and cores. It was determined that 5 teeth needed endodontic retreatment. The crowns and cast posts were removed and the root canals were retreated. Subsequently the posts and crowns were recemented. This patient was 13 and presented with a very large cavity on her lower first molar. Her dentist thought she was too young to have an adult permanent crown. To save the tooth, a root canal was performed and an amalgam crown was placed. This will provide a serviceable tooth until she is of age for a permanent crown. This was a routine maxillary molar with a small radius curve on the mesial root. The final radiograph shows four canals which is the norm for this tooth. Fused rooted teeth often have complicated canal morphology. The cross section of this canal system often makes a "C" and gives them their name-sake. They will often have multiple canals that terminate with delatas. Lower molars can present with an extra root. These roots often have small radius curves at the tip of the root which makes instrumentation and obturation problematic. These teeth are called radix entomalaris. This was a young patient who sustained an injury to his left front tooth. The crown was fractured and the nerve space was involved. An endodontic procedure was performed including a post for root strengthening. The tooth fragment was then bonded back on and his smile restored. Teeth with C shaped canal systems present a challenge to clean and shape. This tooth still had pulp tissue retained in the root. After removing the root filling and placing calcium hydroxide, the tooth became asymptomatic. An amalgam core opaqued with a composite repair was performed to fix the crown.